"This is an easy way to make a meal in with leftover chili." Place the hot dogs onto a microwave safe plate and cook in the microwave 1 to 2 minutes until hot. Place the chili into a microwave safe bowl and microwave 1 to 2 minutes until hot. Slice the hot dogs in half lengthwise, and place onto the bread slice cut-side down; sprinkle with half of the cheese, the chili, the remaining cheese, onion, and mustard. Here is a muffin that's got all of the ingredients and flavors of a corn dog! Awesome! 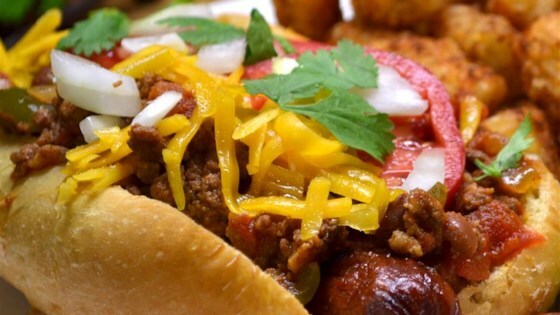 Hotdogs are my favorite food and when I saw this recipe, I had to try it. Everything comes together wonderfully!! I have made my DH these for years... We usually serve with a fork!!!! Good with some homemade coleslaw threw on top too!!!!!! kids loved it and the name lol.